Chop the veggies and saute them with jalapeno and garlic. 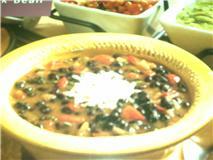 Add black beans, refried beans, broth, lime juice and cumin; bring to a boil. Reduce heat; simmer, uncovered, 10 minutes. Remove from heat; stir cilantro into chili. Top with 2 TB. sour cream if you'd like.